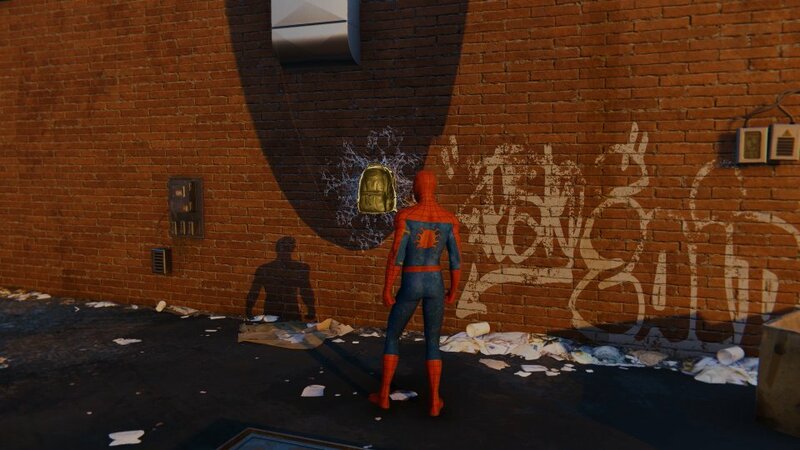 Enough with playing the lab monkey it’s time to hit the streets once again as the friendly neighborhood Spider-man. Captain Watanabe would like to have a chat with you at the local precinct. You can find her in Chinatown not too far away from where your story began so it’s best that you get over there Meanwhile, you’ll be listening to a podcast by J. Jonah Jameson. Arriving at the precinct on the rooftop which is kind reminiscent of how Batman meets Jim Gordon that’s a different comic universe let’s stick with marvels, you will find out that Oscorp surveillance towers installed by the police have gone offline due to a malfunction captain will also explain what she wants you to do to solve this issue. The entire city is covered by these towers and you need to get there and get them back online is best to open the map or look at the markers and get to one tower at a time, starting at Chinatown what we do best plan. 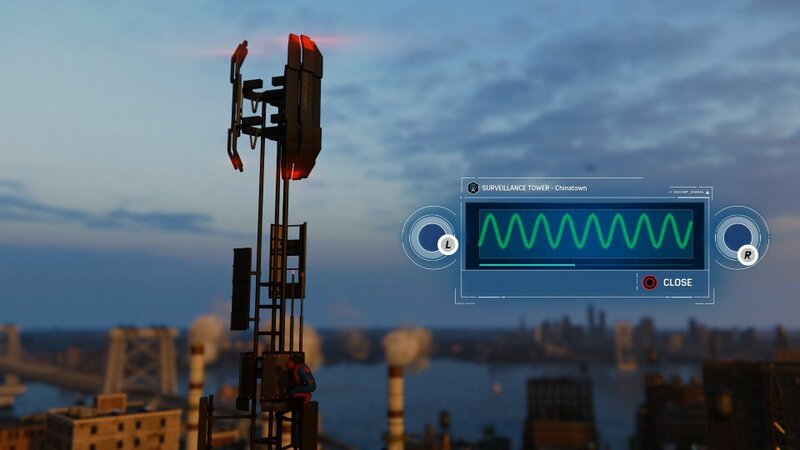 Once you locate a tower, you’ll receive a command to descramble the corrupt signal coming out of the tower. This is where you will meet with another mini game and this time around it will be 2 wavelengths that you have to match by using left and the right sticks on your joy pad. Once you’ve matched both wavelengths tower will come online. Rotate left state to change the width of the wavelength while the right stick will change its height new one first and then move on to the other or if you’re good at it do them both simultaneously it’ll save you time although this mini game doesn’t require you to do a whole lot more. Now that the tower has been repaired it will immediately sync up with your display and allow you to see points of interest in the vicinity you can also look those up by opening your mouth although the nearby once will appear on your mini map. As soon as you descramble the first tower you will come to find out that there is a crime in progress not too far from your position, a break-in so it is best to get over there and stop the progress. 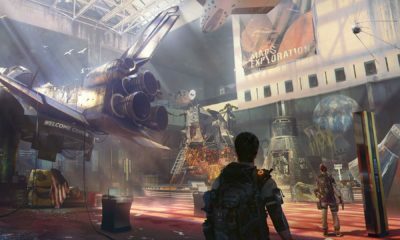 As you get to the area of interest, you’ll find 6 enemies trying to break into a store some of them will have melee weapons like pro bars. 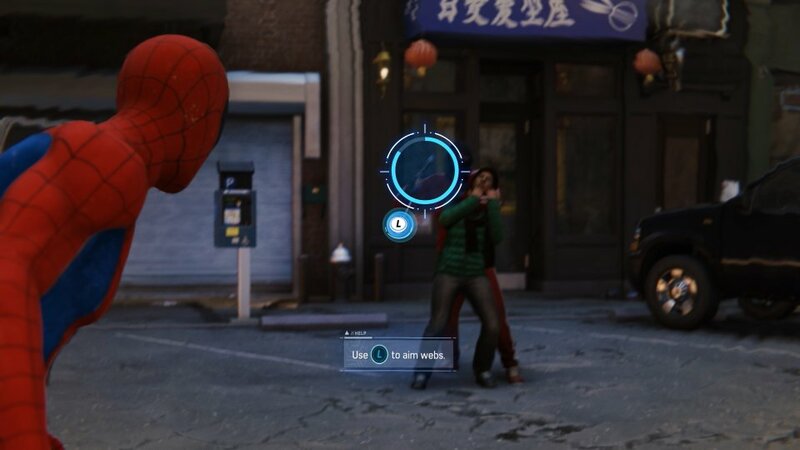 Any enemy with a weapon can cause a lot of damage change is best to lookout and Use the Spidey sense to dodge them. These weapons will also allow them to block attacks so be careful and move in and out of the scramble. 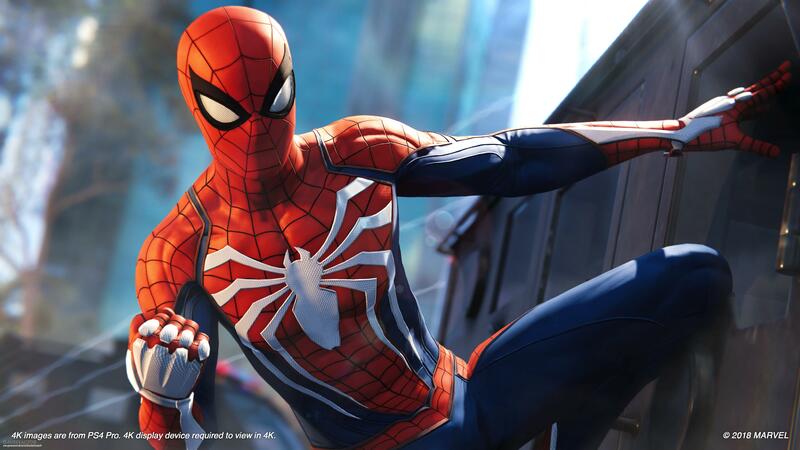 In order to get past their defenses simply web them up throw things at them or uppercut them in the air and finish them off with aerial attacks just like you have done at Fisk tower. This time round there won’t be any projectile weapons so this fight will be fairly simple besides getting into scrambles like these will help you develop better combos for the future. Stopping any crime will gain you plenty of XP and crime token. These petty crimes will pop up all over the city and there will be times when you will miss one or 2 of these but don’t fret because they will appear again. For now you have to save a person out of a pinch. Press in on the nearby crime and start swinging your way over to the next crime in progress. You will find another big group of enemies here and a larger enemy will be among them. 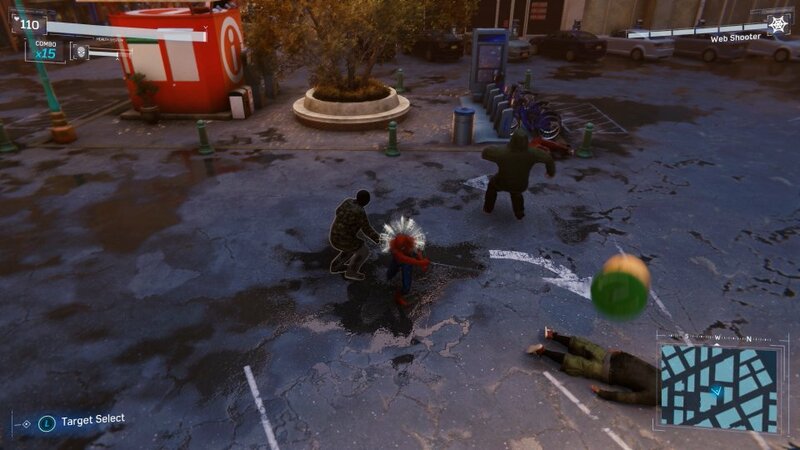 These brutes will be rather reminiscent of Wilson Fisk, do you have more power better defenses and will require a lot more than a couple punches. 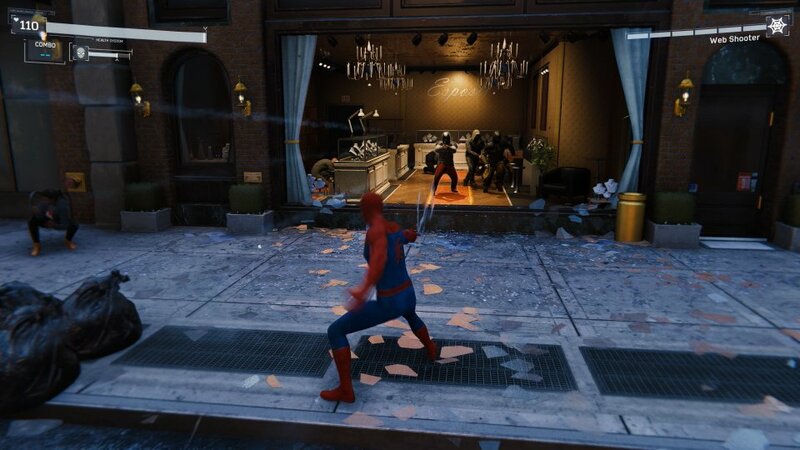 These guys can’t be damaged normally, and the best way to take them down is the web them up and throw things at their faces and make them vulnerable to damage. Be careful because these guys pack-a-punch so it’s best to avoid getting hit by them try to get them one on one and not in a group situation. Let them up early on in a scramble take out the smaller guys and then take care of the big ones it’s best do use the uppercut and throw the smaller guys in the air take them out before you land to the ground. Brute cannot hurt you while you were in the air so use that to your advantage. Once the group has been eliminated the last thug will pull a gun on the civilian and hold her hostage. 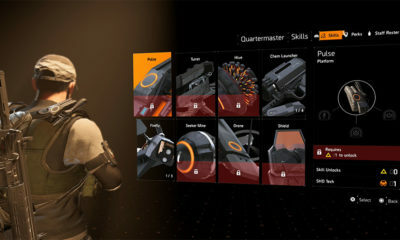 You will have to quickly aim at the thugs gun using the left steak and press R1 to disarm him, finish the fight and successfully save the victim. Now that your duty has been done with acting and saving is a civilian, it’s time to get back to repairing the second hour. Locating any tower concerning this particular mission, it is best you get to a higher vantage point so you can easily spot location. Once you know where it is simply zip over there and get to work. Same old thing as the first tower, match the wavelength of the 2 frequencies and get the tower back online. As soon as the power comes back online more map will be uncovered and with it more locations, crimes and missions. 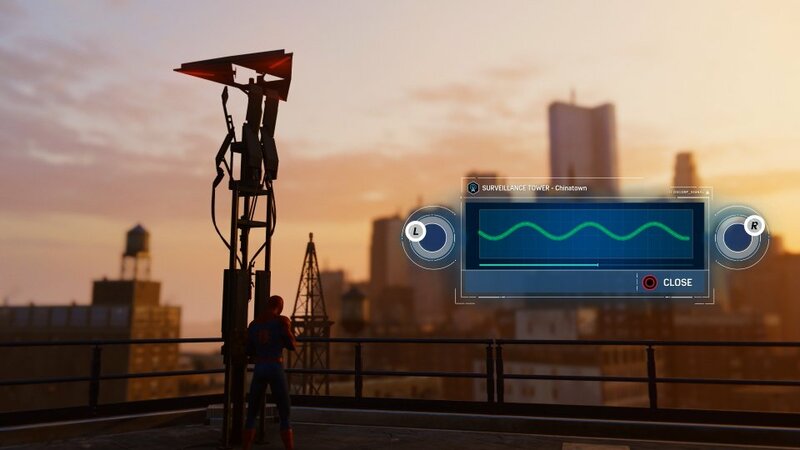 With a bit of hacking, you will now be able to pick up even more signals around the city when a tower is descrambled – like a certain green dot nearby. R3 Can be used to ping it then you can swing over to find a long forgotten backpack that Peter stash during his high school days. This backpack comes with a backpack token as well as some XP and a little item of Peter Parker’s past. There is also a crime in progress nearby your location – a robbery. You must get down there and stop it at all costs. Beware though this time around you’ll be dealing with guns. This particular part of the game has a fixed camera angle plus it will be a bit skewed as you’ll be facing the interior of the store – web up some armed opponents in zip kick into the others. do not let any of them escape for you won’t be able to track them due to the fixed camera – simply turn and dip into them or run into the street to reorient the camera. Once you take out 3 enemies a getaway car filled with robbers’ associates will arrive. 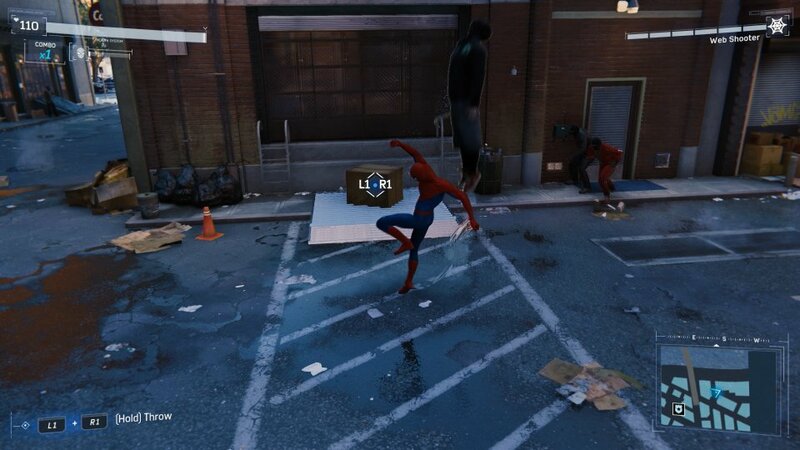 You can get the drop on these guys as they come out of the vehicle by using the cars doors against them: grab them up with you webs and bash their heads in. And just like that another crime will be averted by the friendly neighborhood Spider-Man. Now it’s time to get to the third tower this is the last hour in Chinatown just like before getting to a better vantage point locate the tower and zip to it. 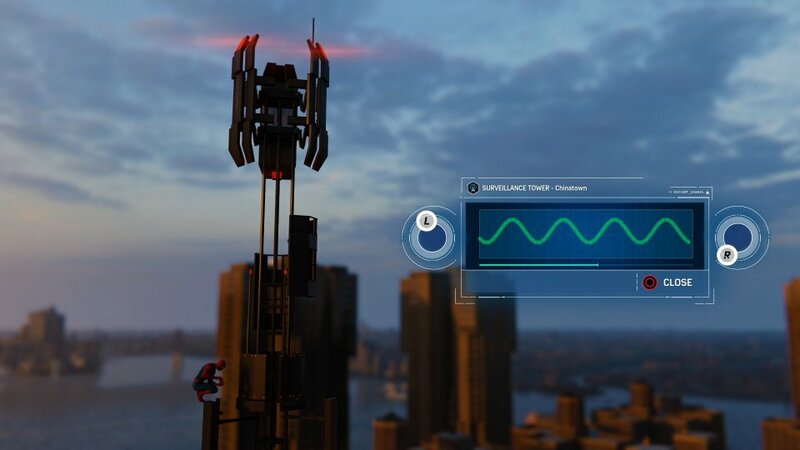 this time around the tower will be up a tall building to the very top but since you are the Spider-Man you’ll have no issues getting up there. Same as before, descramble it and get it online. The entire Chinatown is revealed, you’ll find new elements in the district including more backpacks which will provide you with more XP and tokens. 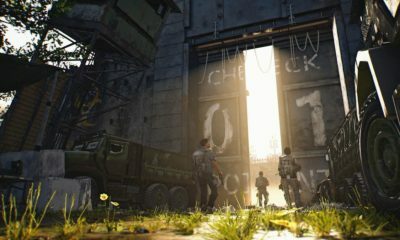 You can also see the progress in this particular area and also what more you need to do in each district that haven’t been unlocked just yet.